If you want to achieve complete success in your life, it is essential for you to have the blessings of Devi Lakshmi and Lord Vishnu. Kanakdhara Yantra helps you get the blessing of Lord Vishnu as well as Devi Lakshmi. This yantra is a way through which people can get immense luck, prosperity as well as wealth. If you can establish this Yantra at your home, it would definitely bring you success and good luck. Even you will get a good opportunity of fortune which is not only for you; rather your whole family will be blessed with the fortune. If you have established Kanakdhara Yantra at your home, within few days you will feel as if avenues of earnings are opening up from various fields and corners. A river of wealth and happiness would be eventually be created at every corner of life. The bestowing facts of Ashat siddhi and Nav Nidhi are associated with this powerful Yantra. The best way to obtain the result would be to keep the powerful Yantra in a temple at home or at a business place. You can even place the Yantra in your Almirah or near your cash box to gain of money. As per the saying of many powerful astrologers, if you have a dwelling of Kanakdhara Yantra at your home, all the ill fate prevailing in your life would be eradicated with the same. Renowned religious leader, Shri Adya Shankaracharya has made the use of this powerful Yantra in the process of getting the rain of gold balls. Once upon a time, Guru Adi Shankaracharya felt hungry. He went to a house. But he only got gloomy tears and moans of the lady of that house. He wanted to know the reason of her meanness. He came to know that there was nothing left for eating except few dry gooseberry bushes which the woman eagerly offered to Guru as she did not want to refuse a Sanyasi with empty hand from her door. Feeling her nobility he appeased the deity Kanakdhara and opened the entrance of good luck for her family. Her house was filled up Gold suddenly. We must go through with some procedures to energise the Kanakdhara Yantra. Firstly we must select an auspicious day and time of the user. Purify your body and start worship with a positive mind to energizing this Yantra. You must get a place facing east to place the Yantra. The placement of light and diya would be the next step in this procedure. Altar should be place with fresh fruit as well as fresh flowers. 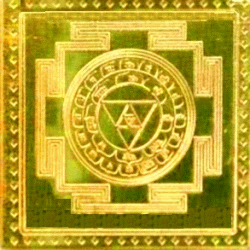 The plan of Yantra should be opened with the image of a particular deity. You must sprinkle water on your body as well as the Yantra by a fresh leaf of a tree. The last step would be purification of your soul and surrendering yourself for devotion. Vedic Yantras can also be energized by reciting Hindu Devis or Devas. If you are into the profession of gambling, horse riding, casino gains, this Yantra would help you to get unexpected profit. Goddess Kanakdhara is worshiped through the yantra so that the house or the family does not suffer any financial crisis.